A bright, clean flavor that strikes a perfect balance between sweet, heat, and tang with a bit of extra barbecue complexity, all combine to make this sauce a real winner. This bottle of sauce was kindly gifted to me by Meatwaver Patrick. 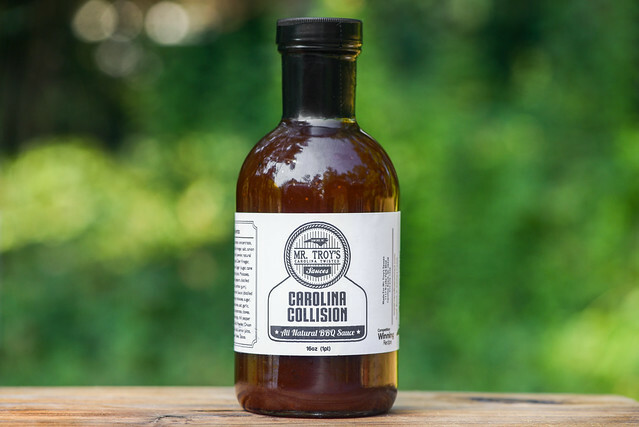 The sauce was developed by Troy Winter of Sanford, NC, who, after having some experience in competitive cooking from World Food Championships and KCBS barbecue competitions, decided to bottle and market two different sauces under the brand Mr. Troy's Carolina Twister Sauces. Currently he's producing this North Carolina-style sauce, along with a South Carolina mustard sauce. The initial aroma of this sauce brings along a vibrant and sweet tomato ketchup character that gains a barbecue profile from also prominent tangy vinegar and complex Worcestershire. Upon some deeper whiffs, a mixture of garlic and onion come into play, along with a mellow heat that struggles to be known from behind the dominant sugar. All of these items have a very fresh smell, giving the sauce a bright aroma. This smooth sauce has a rusty red-orange hue with a glossy sheen. It's semi-opaque, which makes it easy to see lots of spices that come in small red specs, coarse black pepper, and larger white pepper seeds. It has a medium-thin and syrupy consistancy, which has the sauce falling in a fast, steady stream from a suspended spoon. As the flow of sauce slows, that continuous pour switches to drips, ending with a thin coating of sauce left clinging to the silverware. This sauce starts out with a very sweet tomato flavor that quickly gains contrast by way of a strong wave of tangy vinegar. The tartness then becomes the primary player as Worcestershire comes in and adds a lot of depth to the flavor. Next, a mild heat starts to tingle the tongue while onion and garlic make their presence known. Finally, the heat and tang are turned up a couple levels at the end, but not so strong that they drown out the sugar completely, creating a well balanced spicy, tart, and sweet aftertaste. The sauce coated the chicken in a thin, even layer that baked down well over indirect heat and gained color and heft after a few brushings. When moved to direct heat, there was light caramelization and no burn off. The flavor retained its bright character and straightforward flavors. The chicken had an uncomplicated sweet and tangy tomato character with a heat that was more subdued than out of the jar. The Worcestershire also mellowed a bit, giving the ketchup-y taste more prominence. The overall flavor was enough to give the chicken a great barbecue profile, but not so much that it drowned out the light flavor of the meat. It's always a nice surprise to get a bottle of barbecue sauce, and even better when the sauce is as good as Mr. Troy's Carolina Collision. 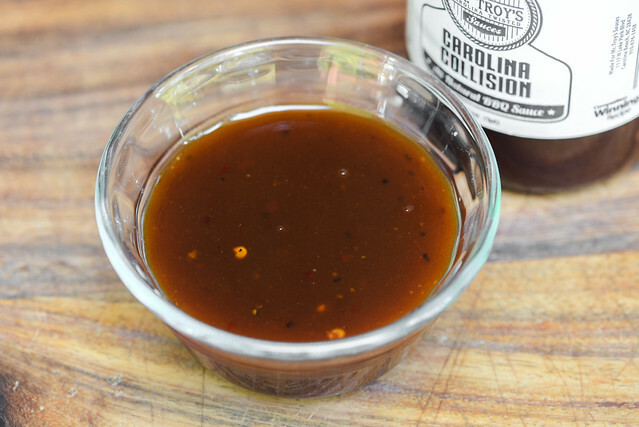 Sure you'll get the traditionalists that say that this isn't a true North Carolina sauce, but it's hard to argue that this isn't fantastic stuff. Out of the jar, I was really impressed with the balance between sweet, heat, tang, and Worcestershire complexity, all with very clean and quality flavors that reminded me of Bone Suckin' Sauce, only better. Once cooked, all of those characteristics remained, albeit tilted a little more in the direction of sweetness, which gave a chicken a really excellent flavor that worked with the meat rather than mask it. 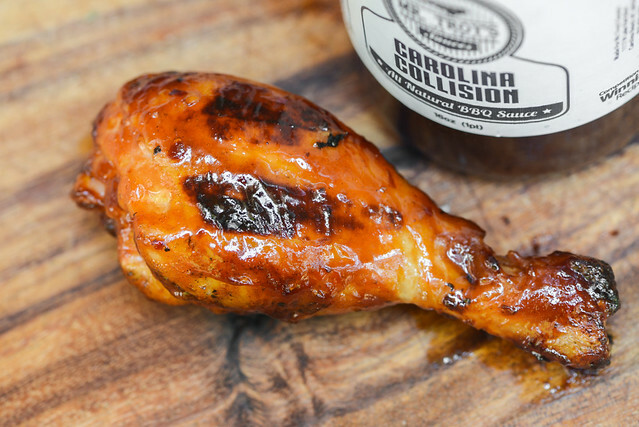 I wouldn't hesitate to serve Carolina Collision at any of my cookouts either as a condiment or finishing sauce—it would do great on wings, ribs, pulled pork, and the like. I would only take some reservation with beef, where the strong flavor of the meat could drown out some of all the excellent stuff going on in this sauce. Great reviews ! I love it and i bought some product. Thanks !